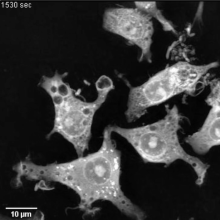 Tissue-resident macrophages, which not only respond to local assaults but also function in normal development and physiology, originate in the yolk sac of the embryo and mature in one particular tissue in the developing fetus, where they acquire tissue-specific roles and change their gene expression profile. 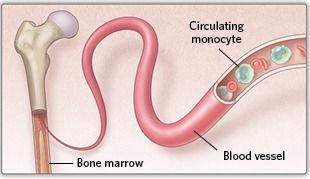 By contrast, circulating macrophages are produced throughout life by the bone marrow, then released into the vasculature to respond to infections and injury. 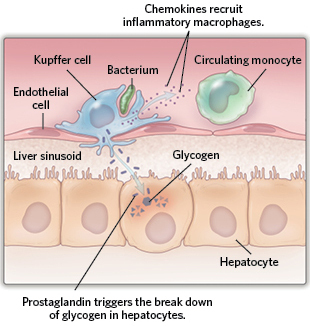 Circulating macrophages (called monocytes) primarily patrol the body for infection, but they can also specialize to perform tissue-resident roles, replacing embryonic macrophages that die. 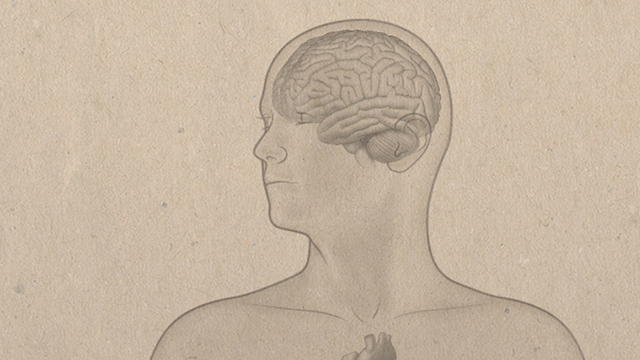 Some scientists believe this macrophage replacement may contribute to aging. 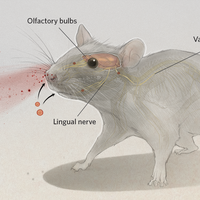 In the developing brain, macrophages called microglia release CD95L (orange triangles) and other signals that bind the CD95 receptor (blue shapes) on blood vessels and neurons, stimulating them to grow and branch, respectively. 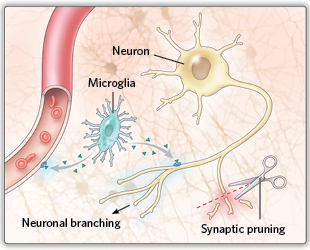 They also orchestrate a pruning process, so that blood vessels grow and new synapses form according to need. 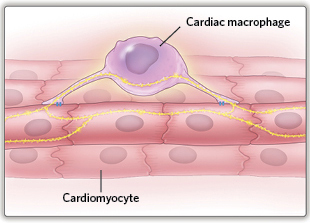 Macrophages in the heart are essential for maintaining a healthy heartbeat, conducting electrical impulses between cardiomyocytes. The cells rhythmically depolarize and repolarize as the electrical impulse passes across them. 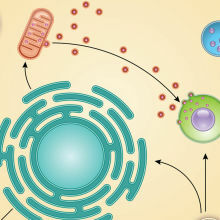 Kupffer cells, the most numerous type of tissue-resident macrophage in the body, digest bacteria and toxins carried to the liver in the blood, break down old red blood cells, and regulate iron and cholesterol levels in the blood. 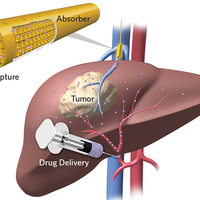 They also help regulate the production and storage of glucose by hepatocytes. In obesity, Kupffer cells can inhibit insulin signaling and activate hepatic glucose production leading to the development of insulin resistance. Injury, infection, and obesity can also cause Kupffer cells to release chemokines that recruit inflammatory macrophages to the liver.